Two amazing flagship caliber Android smartphones, two very different prices attached to them. 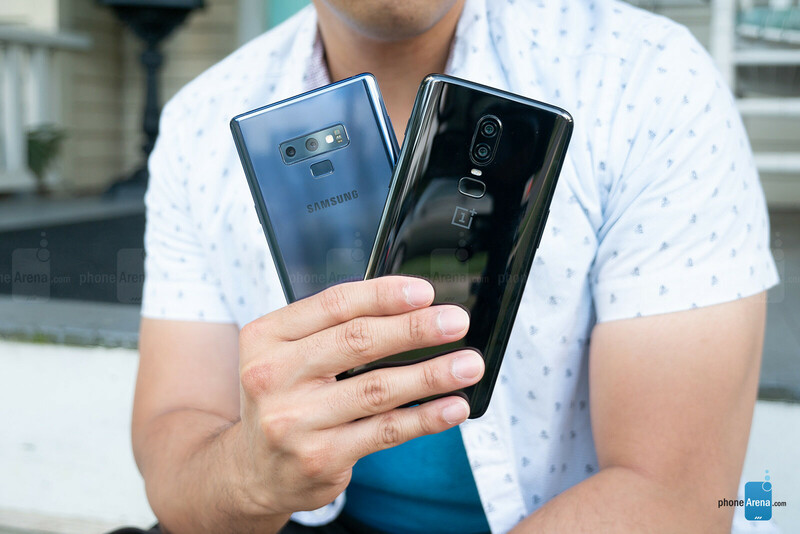 In our latest comparison, we’re pitting the just recently launched Samsung Galaxy Note 9 against a formidable competitor in the OnePlus 6. 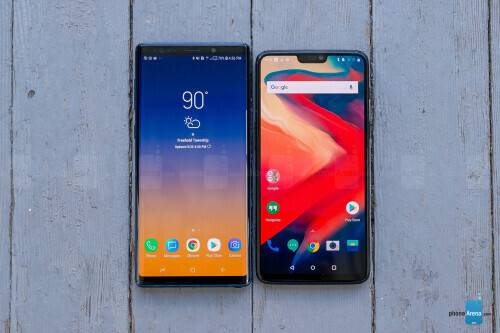 Sure, they’re widely viewed as premier smartphones that have cult followings, but as much as they may share the same platform, these two are vastly different in their intentions. We love the designs of both phones, but who doesn’t because they pretty much exhibit the glass meets metal designs that have become the standard amongst the flagship range. 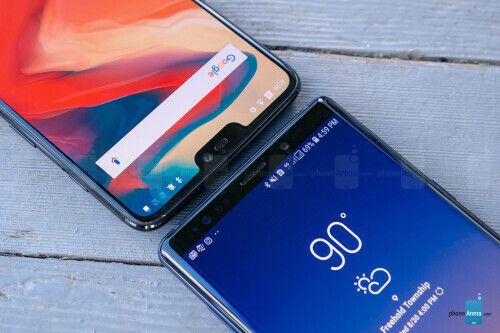 Between them, though, the Note 9 features the more complete and meticulous design, mainly due to how it’s able to cram so many things into its already svelte frame – without making any compromises in the process. Considering how it packs wireless charging, a slot for the S Pen, a heart rate sensor, an iris sensor, dual speakers, and even a headphone jack, it’s an engineering masterpiece that deserves to be marvelled at. Comparatively speaking, the OnePlus 6 is still a gorgeous looking smartphone that feels incredibly solid with its construction. In fact, we like how it offers the better in-hand feel because it’s not as gargantuan or heavy as the Note 9. However, Sammy’s design still has an ace up its sleeve in the form of an IP68 water resistant rating with the Note 9 – whereas there’s none whatsoever with the OnePlus 6. 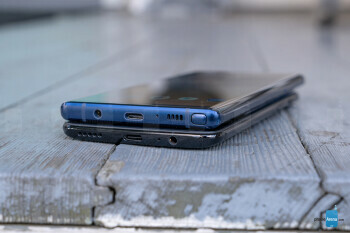 You probably wouldn’t believe it unless we told you, but it’s somewhat of a surprise that despite the size advantage with the Note 9, it doesn’t really have a significantly larger display. It’s packing a 6.4-inch Quad-HD+ 1440 x 2960 Super AMOLED display, while the OnePlus 6 boasts a 6.3-inch 1080 x 2280 AMOLED panel. So yeah, there’s really not a huge size difference – nor is there a noticeable details superiority for either one. They look pretty sharp and detailed, especially from normal distances. Beyond that, the only advantage going for the Note 9’s display is its stronger brightness output of 575 nits – versus the weaker 423 nits put out by the OnePlus 6. Under direct sunlight, we’re better able to make out the Note 9’s display. Since they’re AMOLED based, you can expect to find wide viewing angles and that deep black color reproduction. When we take everything into consideration, there’s still something more appealing with the Note 9’s display – more so when there’s the notch with the OnePlus 6. This is arguably one of the major areas where we see drastic, but meaningful differences between the two. Yes, it’s Android at the core foundation, but their experiences go in totally different directions. On one hand, you have the straightforward hands-on approach with the OxygenOS on the OnePlus 6, which doesn’t add redundancies with the experience. And on the other, Samsung’s experience with the Note 9 is arguably one of the most feature-rich out there – almost overwhelming at times. 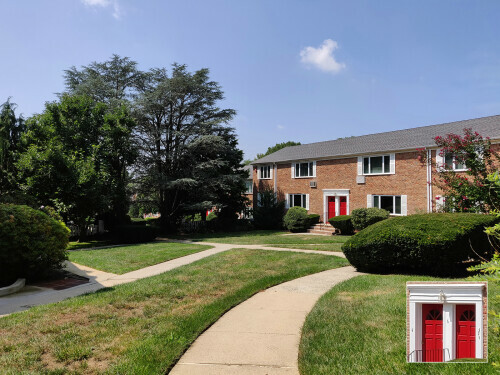 However, it’s purposeful because it does indeed cover the gamut, as it works for the average Joe and those professionals that crave much more. Adding to the Note 9’s experience is the venerable S Pen, a unique companion that honestly has no other equal in the space. Sure, it’s been upgraded with new tricks, but it’s still the only thing around that offers a seamless paper and pen experience out of the box. While the Note 9 may seem to have everything in its arsenal, including the proverbial kitchen sink, the OnePlus frankly just focusses on the core functionality without sugarcoating anything. This one can go either way, mainly because it comes down to personal preference. Comparing the Snapdragon 845 powered OnePlus 6 versus the Exynos 9810 packing Note 9, they’re pretty much performing evenly in several benchmark tests. In real-life, however, we feel as though there’s slightly more responsiveness with core functions using the OnePlus 6 – basic stuff, like switching between apps, scrolling through the web browser, and much more. For some, it may be indistinct, but for those with a knack for detail, it simply shows how a straightforward UI approach can boost the performance. The OnePlus 6 is available in either 64GB, 128GB, or 256GB capacities, while the Note 9 comes with either 128GB or 512GB of storage. Naturally, we’re content with the OnePlus 6’s starting capacity of 64GB, but the 128GB accompanying the Note 9, plus expansion courtesy of its microSD card slot, is undeniably much more appreciative. Things get even juicier when we take a peek at their cameras, both of which go for the dual-camera implementation. With the OnePlus 6, it packs a 16MP main camera with OIS f/1.7 lens, as well as a secondary, 20MP camera. The latter is mostly there to aid with portrait shots, it’s not a telephoto lens. Meanwhile, the Note 9 goes with a main, wide-angle 12MP shooter with OIS and a variable aperture that shoots at f/2.4 when you have good light, but opens wide to f/1.5 at night. The secondary camera is a telephoto one, with a 2x times zoom and optical image stabilization for better shots. Around the front, there’s a 16MP camera with the OnePlus 6, versus an 8MP one with the Note 9. When it comes to the shooting experience, we’ll certainly give it to the Note 9 – mainly for the fact that it offers an abundant set of modes to choose from. 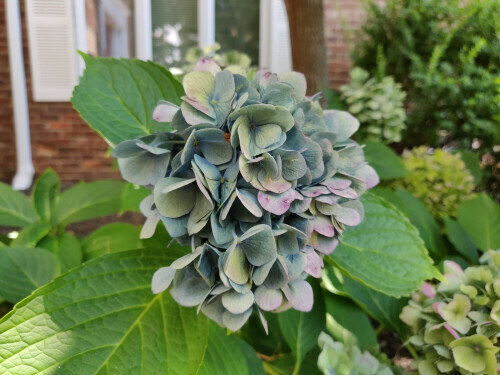 From a crazy super slow-motion mode, to the interesting compositions with its hyperlapse mode, and the somewhat novelty of AR emoji, the Note 9 clearly has more to offer for enthusiasts. OnePlus’ implementation is a purposeful one, as the camera interface mirrors the simplicity of OxygenOS, by offering fewer modes to eliminate redundancies. Seriously, we were astounded after comparing the snapshots! In making it a fair comparison, we turned off the Note 9’s scene optimizer mode, since it’ll adjust the composition according to the shot, and proceeded to capture photos on the automatic mode with both smartphones. Frankly, they both produce outstanding photos with almost little distinction if you just quickly glaze over the shots. However, there are some things we’re able to pick out! We found out that the OnePlus 6 offers better dynamic range, managing to evenly expose shadows and highlights – whereas the Note 9 tends to overexpose the highlights. Details, on the other hand, are both nearly identical. 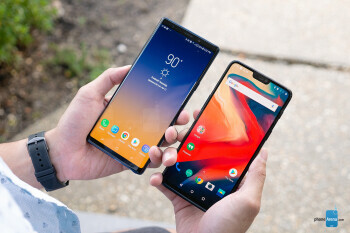 With their color reproductions, the OnePlus 6 skews on the colder side, while the Note 9 goes the opposite by exhibiting a warmer one. 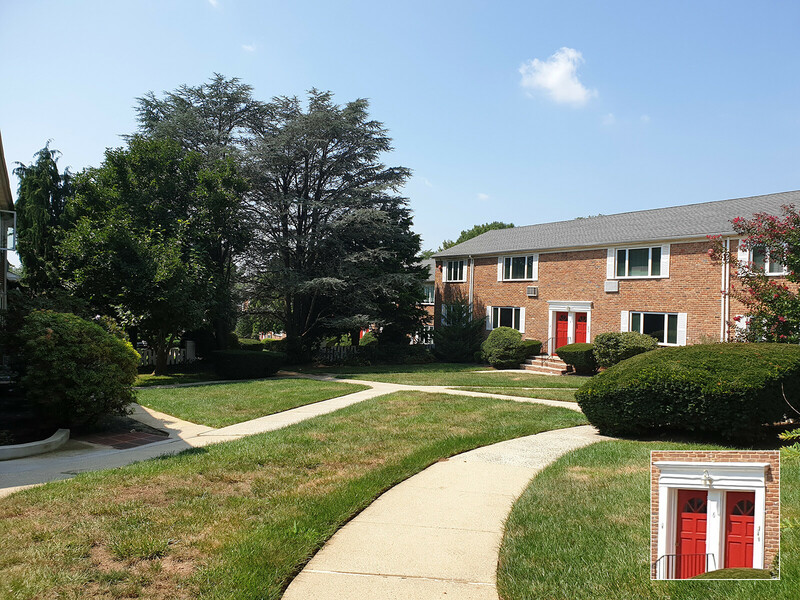 Meanwhile, the OnePlus 6’s front-facing camera proves its worth by delivering more detail and sharpness. Under low light, we were leaning towards a crushing victory for the Note 9, but that’s not really the case. Even though its overall performance is indeed better, offering better exposure when there’s barely any light, with more details and less noise, the OnePlus 6 manages to deliver solid results as well. Although, it’s slightly underexposed with softer details. Yes, there’s a noticeable level of noise in the shadows, but it’s not terrible. Impressively, though, the OnePlus 6 does better in low light when there’s a strong contrast with light sources in the scene – with its dynamic range proving to be superior. For recording video, we kept the two phones at 4K UHD 30FPS. 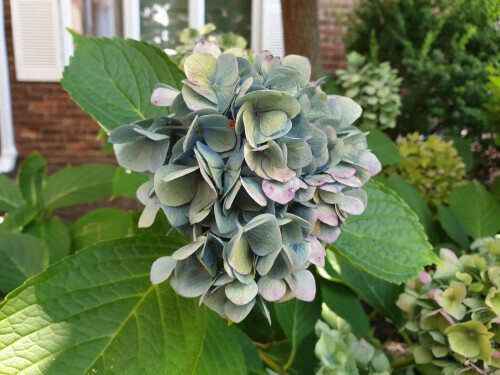 Admittedly, both phones produce favorable video footage, seeing that there’s an abundance of details, smooth stabilization, and rich colors. 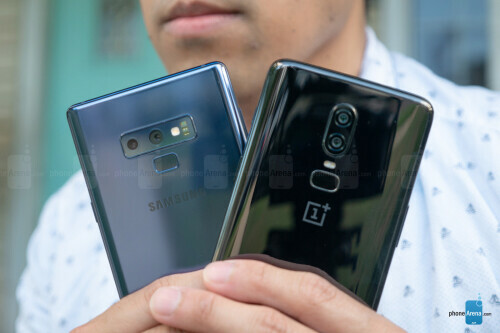 If there’s one big difference, it has to be that the Note 9 often increases the exposure with shadows, so that more details are drawn out – whereas with the OnePlus 6, it ends up appearing darker. Just because it’s packing only a single speaker, you can’t count out the OnePlus 6’s audio punch because it churns up a boisterous 79dB output. In comparison, the dual-speaker configuration of the Note 9 brings in a total output of 74.6dB. Thankfully, we’re extremely happy to see that both phones come with headphone jacks, which undoubtedly are conveniences in an era of headphone-less flagships. Over on the video watching side, we’ll give the advantage to the Note 9 mainly for the fact it can play 1440p60 HDR videos in YouTube. When it comes to placing and accepting _phone_ calls, both handsets are fit for the occasion by offering strong volume outputs, pleasant voices with minimal distortion, and speakerphones that are audible in noisy conditions. 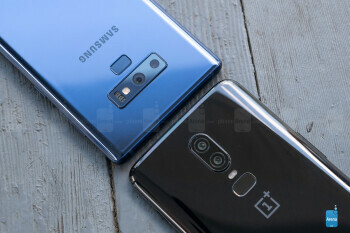 Yet another advantage for the Note 9 on paper is its larger 4000 mAh battery cell, versus the 3300 mAh one in the OnePlus 6. Then again, you really shouldn’t base performance solely on specs, as the OnePlus 6 manages to do nicely against its rival. 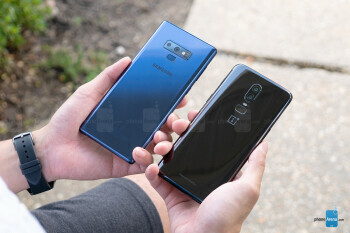 In our real-world experience, there’s not one _phone_ that has more gas in the tank by the end of the day, but we still nonetheless notice the Note 9 having a little bit more. Moreover, our battery benchmark tests indicate something similar because the Note 9 reached a mark of 8 hours and 56 minutes – while the OnePlus 6 isn’t too far behind at 8 hours and 10 minutes. OnePlus’ Dash Charge technology is pretty remarkable, too, just because it’s able to charge the phone’s battery in just 80 minutes – while the Note 9 requires a little bit more time at 109 minutes, which could be attributed to its larger battery capacity. We will note, however, that we appreciate the Note 9’s wireless charging capability, something that’s not available with the OnePlus 6. 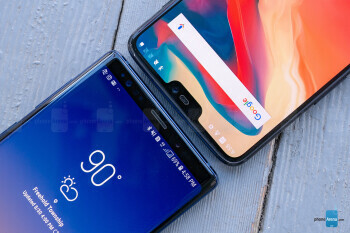 As we stated at the beginning of this comparison, we have two flagship caliber smartphones with vastly different intentions. Well, the same can be said about their prices because the Note 9 fetches for $1,000, while the OnePlus 6 is much easier on the pockets with a starting cost of $530. The difference there is apparent, it’s substantial to say the least, but there’s always the argument for choosing either device as the winner. If you’re just looking for a phone that covers the essentials, without adding any fluff in the process, then the OnePlus 6 is without question the phone to go with. At nearly half the cost, it doesn’t have all the bells and whistles of its rival, but it still manages to go toe-to-toe in several key areas – like its impressive camera performance and battery life. On top of that, you’re getting a premium-designed phone that looks just as good! 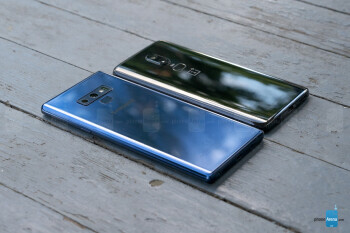 Now, if money isn’t a problem, or if you simply want the best-of-the-best, then the Note 9 is the logical choice. Despite costing nearly double, you’re getting features that are absent from the OnePlus 6 – like wireless charging, a water-resistant construction, dedicated heart rate sensor, double the storage, a microSD slot, and a versatile camera rich with various shooting modes. The list goes on! And there’s still the addition of the S Pen and all of those productivity features with the software.